Just keep shaking your head, no one cares. Let’s take a look at just the last 2 weeks of footpath history without being touched. 2 power cuts and 3 holes dug in to the paths on Station Lane. The path repair team managed water cut off and on over 2 days as WMDC workmen excavated a water main stop tap with a JCB and not a spade. WMDC still refuse to talk to residents and shopkeepers as works are still in progress. As ever not a Cllr in sight. 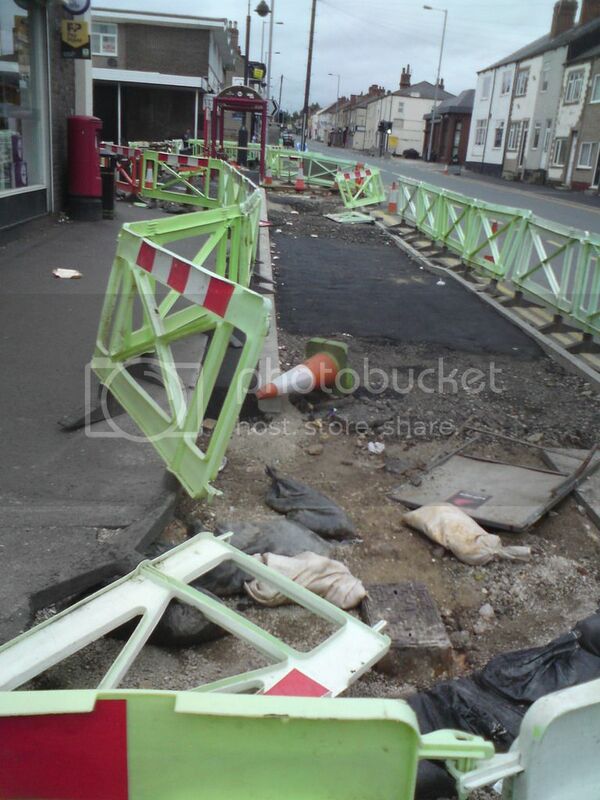 If WMDC really think that no one is noticing the continued lack of interest and skill being used to refurbish our high street paths here are a couple of picture for the record when everything sinks. What a complete bodge. I guess outside Onestop the hole was so big that workmen have back filled it with rubbish and not compacted hard-core. So after digging a hole that was water logged the repair is to infill with spoil without compacting followed by sharp sand with out compacting and laying the same old bricks on top. Everyone else knows you need concrete under block paving especially as our footpaths are a car park. I assume this manhole will sink as it has had it foundations removed for a skim of post fix. And still every day our Cllrs drive past and say NOTHING? Just a point, shouldn't the bus stop curb have a raised disabled speck? No surprises with this week’s regeneration attempts. The Station Lane weight limit scheme incorporating a residents only zone on Post Office Road and the new Green Lane link road is now a month behind starting and looks 6 to 8 months away. Meanwhile due to the new path a new water pipe burst has begun on the corner of the cross roads. Works look due to start just as traffic lights go up for a month from 1st August outside the Junction Pub. Then the week got a little more interesting. 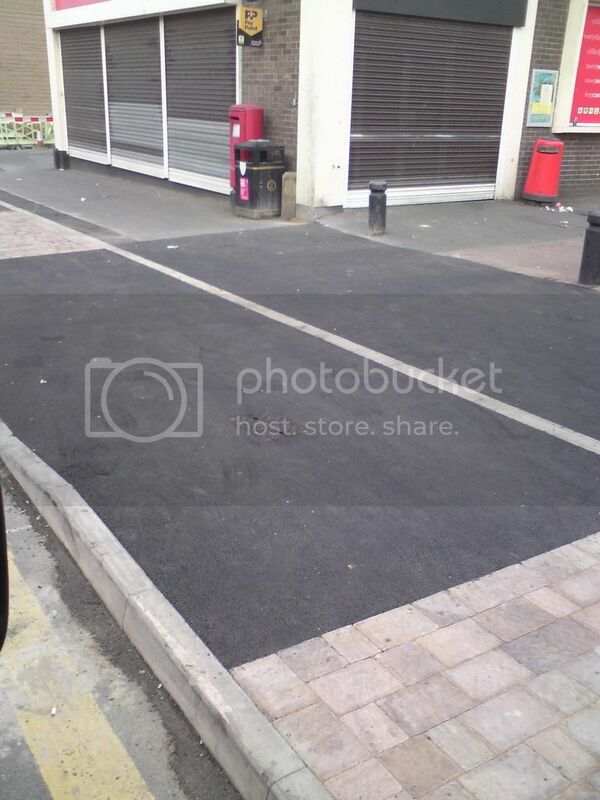 Works finished outside OneStop and immediately cars began to park the tar is all ready pulling up and showing tyre marks and sinking. Sadly how are people to learn any better when our local Cllrs do the same and park on double yellows? Workmen moved on to Fearnley Street corner and have informed one shop owner that they are not doing any more. Best of all it appears that the ownership of the land and the Yorkshire stone flags taken by WMDC has been subject to a re-think. Apparently the Yorkshire Stone did belong to the many properties and will now be returned upon request. How much is that going to cost to put right? Just keep shaking your head, it’s all you can do living in Labour Featherstone. Here is an unusual one. At 7.45pm on Friday night a road sweeper and trailer arrived at the corner of Fulton’s and Betfred. For the next hour the most unusual road repair began. Around both corners the tarmac was cut at about 2ft from the curb. A scrape was then made of the surface. Then tarmac was shovelled on to the un-compacted surface and then was finally rolled by using the wheels of the road sweeper and not a road roller. 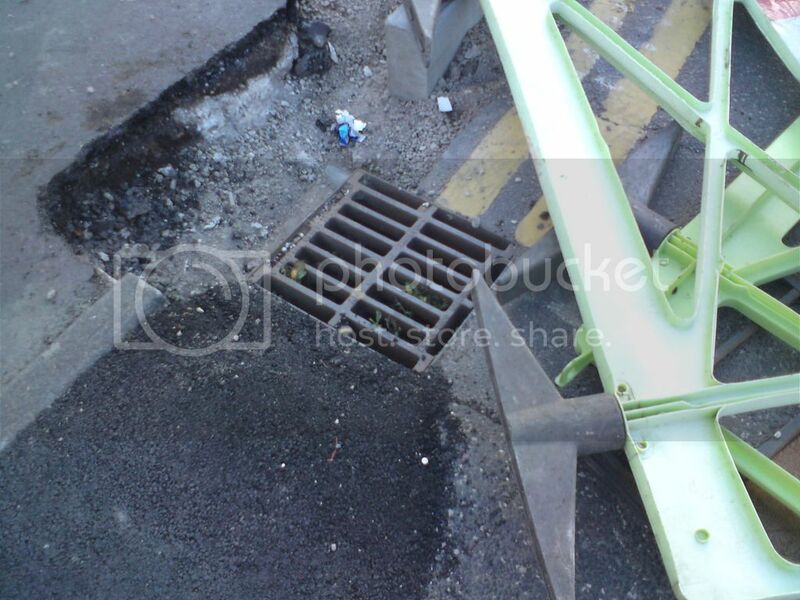 The finished job is an uneven surface lower than the original and has not been sealed at the joint with tar. The surface is all ready breaking up as it sticks to vehicle tyres. The big dint in the path caused by the JCB renovating the path is still there for all to fall in. The road was better before? So tens of thousands of pounds later I think a fair job has been done to keep some originality. 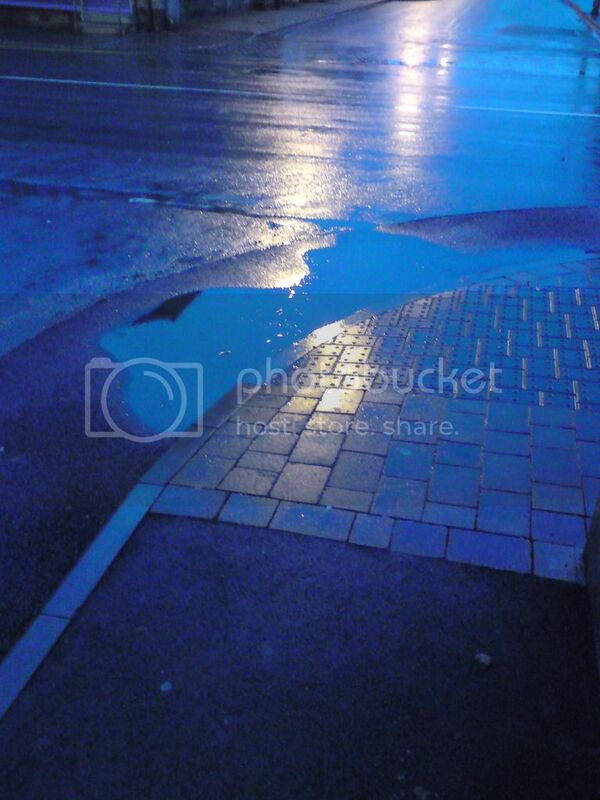 The puddles are just the same but now neater around the edges. And then the suits arrived in Station Lane today pointing and planning the next footpath fiasco. This will be the bottom of Station Lane and huge traffic problems if done in the same way. The ownership of land will be a very interesting battle. You would have thought by now that local Labour Party Cllrs would have learnt they cannot railroad everyone in Featherstone. Without talking to any owners involved WMDC has paid for a survey of the canopies around the precinct with a view to taking them off. As they do not own any of them and have no idea of the structure you can only shake your head regard this regeneration attempt by the committee that excludes everyone except them. Not that it helps anyone in Featherstone but at least now we know where Featherstone’s regeneration money is being spent. 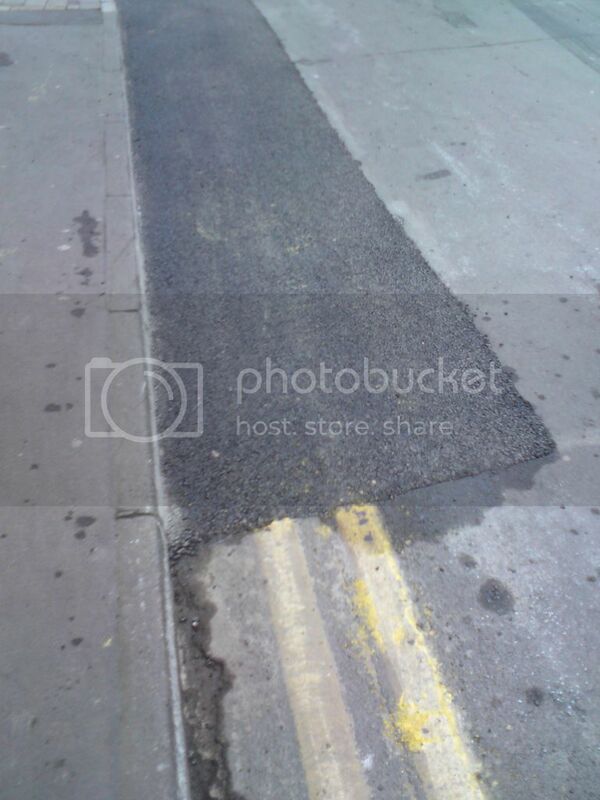 It appears Labour Cllr Peter Box is not happy with the colour of the tarmac in Wakefield town centre and has ordered a re-fit at a cost of over 6 million pounds. Meanwhile our Cllrs remain with their heads in the sand. Two weeks in to the late start of trying to fix the paths on Station Lane and a whole can of worms has been opened. So far WMDC still continues to refuse to talk to any business on Station Lane regards issues of damage caused or land stolen. Looks like WMDC have bulldozed a little too far this week. The Yorkshire stone strip of flags marking property boundaries has again been ripped up. But instead of taking away the stolen goods it appears WMDC have adopted a new policy. WMDC has donated the stolen Yorkshire stone flags to the local smack head community. Smack heads all week have been appearing with wheel barrows and taking the stone. It gets better as they are now trying to find a buyer and asking about how much it is worth. They have a few stock piles now in interesting places. The local labour council who do not read this site will not be concerned about this nor the breach of recycling policy. Good job it’s easy to sort out with one simple freedom of information request for paperwork that obviously does not exist! Almost 2 years in and the Station Lane footpaths are nowhere near finished yet there is more plant machines on site than workers. Yorkshire Bank don’t sound to happy just as they close a sale on the old bank as someone has used a still saw to cut stone on their £8k front door and filled the building with dust. Must be a record for the slowest job in the UK? Meanwhile until the work is finished the other issues like Green bad parking are on hold. But hey who cares? Its been interesting to sit back, watch and take notes for the last year as the **** of Featherstone continues. It was never going to be long before someone over steped the mark. It will be interesting to see how communicative the Labour party will be very shortly. You would be right to ask why has Station Lane had traffic lights at the cross roads for over a week and only 3 hours of work has taken place? WMDC still refuse to talk to any traders on Station Lane about the way the job is being done and it appears WMDC are all powerfull as they handle their own complaints. Oversized excavators sinking in the road are just a hazard for later. There appears a deathly silence from our cllrs. Sorry not total silence as one senior lady made clear. Apparently local labour party cllrs have told some people at the coffee morning that the bottom of Station Lane can not be re-surfaced due to the number of heavy goods vehicles one small shop gets each day! Seriously! Possibly the cllr got mixed up when they repeatedly parked on double yellows and hindered a supermarket delivery each time (pictures available). Monday 23rd April. WMDC workmen turn up and again begins another day of bizarre circumstances that sadly now appear to have contributed to 2 road traffic accidents that have injured 4 plus. Workmen turned up about 8 am and sat waiting in a car park. About 10am another person turned up and the fun began. The workmen stood well up the street as if they dare not approach the area they were to work on. Some workmen stood well away and looked embarressed by the situation. A wagon with temporary traffic lights loaded was pointed to park awkwardly at the junction and was then trying to read instruction from someone about 200 meters away. The situation continued and finally workmen came to the wagon to get the traffic lights. The workmen were the same very nice men and they asked if anyone had talked to any traders. They were surprised and shook their head when told WMDC still refuse to talk to anyone. The workmen had been told to do the next path after last week when they could not work as their plan needed traffic lights. The workmen continued to fit the temporary traffic lights. By the time they had finished at dinner time and switched on there had been a number of cars stopping at the temporary lights as directed by signs but they were not working yet. It was clear that the sighting of the lights had been made up that morning from a distance and was causing chaos to all traffic in Featherstone. At the risk of getting a WMDC communication ban a call to the department at WMDC who refused to talk was made informing of the of the DANGEROUS situation and the last lady who had been informed called Mrs D**** who had since moved on. The responce was Mrs D**** had not moved on but was doing a different job and was in his room. When asked why Mrs D**** would not reply the information was Featherstone is just trying to cause trouble as it hates WMDC. There was plenty more said. Very sadly while the lights were on there was a serious accident resulting in 2 injured. This was followed very shorty with at least 2 injured in another accident just off the same road. Both accidents appear to be reported as due to the congestion. The road in question all ready has an high accident rate as they pass through a crossroads that was altered yet condemend by WMDC own highways department at planning yet still passed. At least 1 insurence company is looking in to the traffic lights. By 3.30pm the temporary traffic lights had gone and no work had been done. It would appear fair to say that it possibly looks like WMDC may have caused suffering to many people without a need to do so. And then out of the blue a whole new possible reason why Featherstone is being subjected to a traffic jam nightmare! Why would anyone cause traffic jams? Perhaps someone who cares will talk about Featherstone this week? Friday 27th. No work all day. That is except for one man doing a 12 hour shift sat parked in the Lidle carpark facing the road in his truck with all the lights flashing away. Why the flashing lights. Tuesday 1st May. 2 men spend 4 hours with lunch to fit 7 curb stones. I hope the plant machinery isnt on hire. Wednesday 2nd May. A new truck appears without flashing lights parked blocking the path on George St facing the hole with one man sat all day? At least this guy was in the right place to see a stolen car being anbandoned in front of him, but then back to keeping the seat warm. Thursday 3rd May. Another unusual day. The truck with single male again sits for a 12 hour shift blocking the path on double yellows at the entrance to a school. It has been suggested he is the H&S man? And then action, mid morning with more barriers going up and more traffic lights further up the street outside the vape shop. The over sized JCB arrives. The 7.5t tipper arrives. All set up and ready to go. The polite workmen again ask if WMDC has contacted anyone and again the reply was no. The workmen had been told now to leave the Yorkshire stone and lift any parts straight. Then the sun came out and the workmen enjoyed the sun sat on a step until dinner time. With lunch over it appeared that someone else had been trying to fill pot holes locally and had some tarmac left. This ended up in the existing hole outside the dentist which is supposed to be block paving? With no work started on the newly set up area the equipment was then packed up. End of week 2 on Friday and it has to have cost over £20k so far. You could fix every pot hole in Featherstone for less than that? Friday 4th May. No man in a van and no works at all apart from taking down signs and tempory lights and re-stating the original traffic lights. Large vehicles still struggle to get past the barriers. Still WMDC refuse to talk to anyone. After considering the events of today it appears that WMDC do not have to talk to anyone if they choose and because of this the Local Government Ombudsman is now overwhelmed with similar complaints. As the Local Government Ombudsman cannot reply in its designated time period then it now looks like the next department is Central Government to ask for help? WMDC visit today: The missing WMDC man called Jim appeared at my shop about 11am today to deliver the letter you see below. Jim would not talk in the shop and asked to stand outside in the street covered by CCTV. An un-official conversation was held. Again, I now have 2 different versions of a conversation written and now write what is fact and not withheld as a gentleman’s agreement. He informed me that our agreement had been broken by people at WMDC and that WMDC had now changed their mind. There would be no Yorkshire stone brought to make repairs. WMDC on Monday 30.07.18 are now going install temporary traffic lights for as long as it takes to do the work. This could be for up to 4 weeks. The temporary traffic lights will be left up all day so that the night work can continue. I pointed out that previous work was only 2.5 hours per night for 2 days and 5 days of traffic lights at a huge local financial cost to locals. No confirmation could be given of how many weeks the temporary traffic lights would operate for. When it was pointed out that the notice letter he was giving to me from WMDC was only giving 1.5 days working notice and was un-reasonable notice the reply was that this is what he had been told to do. In fact, WMDC had intended to post the letters so they would arrive on Monday 30th but Jim had taken the job on as it was apparently him who was going to get it in the neck to try and sort the mess out. The explanation of the proposed works was beyond belief! Apparently WMDC have now changed their minds again and they are now going to remove all the Yorkshire Stone except for one small area. This will require disrupting what has all ready been done and then laying tarmac on soft ground. Not only has WMDC changed it mind about the Yorkshire stone but Jim had been given the job of asking each shop to leave its shutter up until 11.30pm each night so workmen could steel their property, land and rights. When some shops asked to talk to who was in charge they got the same answer which was call WMDC if you have a complaint. As WMDC refuse to talk who will cover insurance considering you cannot hang a St George flag in the street without it getting ripped down? What was definitely clear was that 4 weeks ago when the traffic lights were last in action and many complaints were made yet again something hit a nerve with one of the new contacts copied on to emails. Bizarrely also the new plan is to dig up the good side of the street first before fixing the mess that has all ready been made. They are not going to finish the path they have started and are going to continue to leave it in a dangerous condition. When questioned why a 6-month project that should take 3 months and started 3 years ago was still not finished a gentleman’s answer was agreed. Ok so man to man can I or anyone meet with who is in charge? The reply was I have been told do this job. Jim pointed out the back of the letter and the 2 names and phone numbers printed. One name was Jim’s. As he could not reply he suggested calling the other. This had been called and message left with no reply. Jim told me that if I had a concern I should contact the council. I informed him again that I had but had been informed if I tried to communicate on the subject again I would get a 12 month ban from communication to WMDC. Jim asked who had informed me of such and I replied again that the contact was Mr Dickenson at WMDC. Jim could not understand why Mr Dickenson and not WMDC highways had been dealing with this. In the last 3 years there had been a number of people loosing / being moved from jobs while on this job. Interestingly due to our conversation fly tipping was mentioned on the street. I pointed out this was no longer a criminal offence and the police no longer give out crime numbers for it when reported. Jim disagreed strongly. I informed him of the Post Office Road fly tippers dumping 7.5 tonne per load for months and the police response. Jim made a call to persons I do not know who said WMDC would prosecute whatever. To end the conversation, I pointed out that our conversation did not match the information on leaflet. No comment could be given. I asked if it was true that WMDC are creating traffic Chaos in Featherstone in order to create a false picture to enable a funding application for the new bypass? Again, no comment was given. I asked why the date of the letter was the 23rd and not today the 27th. No reply could be given. 1. Traffic chaos with big delays and at peak times and up to 2 hours to travel through Featherstone. 2. Bus services will be cancelled or will run with delays. 3. There are other road works around Featherstone that will have traffic lights as well. 4. Shop keepers have not officially been told but apparently some have been asked to keep stutters up on a night for the next few weeks. 5. The work that had all ready been done is now to be re-done for the umpteenth time. 6. The 110 plus year old Historical Yorkshire stone is now going again which will be classed as theft. 7. WMDC still refuse to listen to reports with video of dangerous and disruptive practices which are now set to continue. What the public can do? Not a lot really unless many have a go. 1. You can call WMDC and your complaint will be logged. This is usually a 20 to 50-minute wait. A reply will be given in 28 days. However, if Featherstone folk do complain in mass like last time WMDC switchboard will block up and create some questions. 2. Below are the contacts given by WMDC. Jim is obviously no good as he is not allowed to talk and Derrick so far only has an answer machine that does not call back leaving the contact centre and a long wait. 3. It is now clear that the past and present problems have been ignored by local Cllrs. One district Cllr was questioned on Friday via a blog and replied with a totally different answer. As a district and town Cllr you would be aware of issues not to mention having to drive by them each day. It will be interesting to see the replies from ALL our Cllrs when they start getting bulk emails this week. In defence of our local Cllrs so far allegedly WMDC is not telling them everything either. Someone is not telling the truth? 4. WMDC has changed a lot and so has how to report issues others should deal with. The last time this happened MP Jon Tricket was contacted. His first response was he could not act on one complaint. This was put right within hours as the MP then received many complaints from many people. The MP the received details. Still awaiting a response from the last disaster so don’t hold your hopes up. 5. The police have been made fully aware of these traffic problems all the 3 years especially with the amount of accidents recently in traffic. If you see something that is not right report it. The more that do the better. 6. If you decide to call HSE Leeds, The Ombudsman or the Transport Agency save your time. After 28 days you will be told you have to contact WMDC.